PHOTO BY JACOB GURNEY Rescue personnel work at the scene of an accident at TR 8 and SR 63 Thursday afternoon. One person was injured in an accident involving a car and a school bus at SR 67 and TR 8 Thursday afternoon. 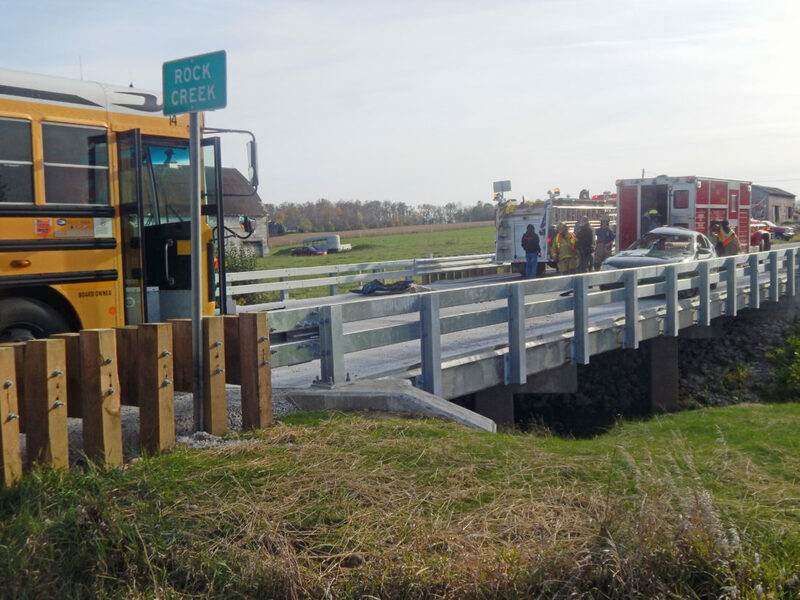 Trooper Allison Young of Fremont post of State Highway Patrol said Jamey Curtiss, 40, of Republic, was traveling west on TR 8 and Teresa Felter, 47, of Republic, was driving a Seneca East school bus south on SR 67. At the scene, Trooper Richard Donovan of Fremont post of State Highway Patrol said Curtiss pulled into the intersection and was struck in the side by the bus. Curtiss was transported by Bloomville EMS to Mercy Health – Tiffin Hospital to be treated for non-life-threatening injuries, Donovan said. Felter and two students who were on the bus were not injured, he said. The names of the students were not available Thursday night. Capt. Mark Snavely of Scipio-Republic Fire Department said Curtiss had to be extricated from the vehicle. Rescue personnel had to use JAWS of Life, spreaders and cutters to open the passenger-side door and remove the seat to get him out because the driver’s side of the vehicle was pinned against a guardrail, he said. Curtiss was cited with failure to yield at a stop sign, Young said. Felter and Curtiss were wearing their seatbelts, she said. Superintendent Laura Kagy of Seneca East Local Schools said the family of the students, who are siblings, was contacted and was able to come to the scene. The bus received minor damage and it was unknown Thursday how much repairs will cost, she said. Kagy said there will a substitute bus and driver for that route today, but other routes were not affected. The accident was reported at 3:40 p.m. and Bloomville EMS, Republic EMS, Scipio-Republic Fire Department, the Echo unit, Seneca County Sheriff’s Office and John’s Towing and Welding assisted at the scene.